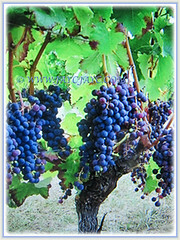 Common Grape Vine is economically important as a source of grapes, both for direct consumption of its sweet fruits and for fermentation to produce wine. Also, it can be dried to produce raisins that are popularly used in cakes, eaten as is or added to various dishes. 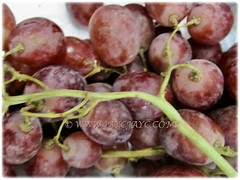 Common Names: Common Grape Vine, Wine Grape, Purpleleaf Grape, Anggur in Malay. Origin: Native to the Mediterranean region, central Europe and southwestern Asia from Morocco and Portugal north to southern Germany and east to northern Iran. It is widely cultivated elsewhere around the world except Antarctica. Plant type: An ornamental and fruit-bearing liana. Features:Vitis vinifera is from the genus Vitis that consists of 80 accepted species of vining plants. It is a fast-growing climbing shrub with a twining growth habit and flaky bark that can reach up to 32 m tall. Woody stems that can be 15-20 m long are produced. The leaves have specialised functions as tendrils and are forked and produced intermittently opposite the leaves. Its green and petiolate leaves are simple, palmately lobed, 5-25 cm long and broad as well as coarsely toothed along the leaf margin. Leaves underside is coloured pale white. Foliage are arranged alternately along the stem. It produces clusters of hermaphrodite and fragrant flowers that are coloured green, yellow and golden. Pollination by insects is required for fruits to develop. Eventually, the flowers will be followed by fruits. Its fruit is a berry known as a grape. A fully ripened fresh fruit is sweet, juicy and delicious. The edible fruits come in various shades of dark blue-purple, red, green, yellow and orange as well as are sweet or sour to the taste. Each fruit contains 1-5 smooth and pear-shaped seeds. In the wild species, it is 6 mm in diameter and ripens dark purple to blackish with a pale wax bloom. In cultivated plants, it is usually much larger, up to 3 cm long and can be green, red, dark blue-purple and orange. This species typically occurs in humid forests and streamsides. 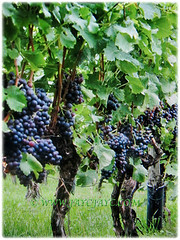 Culture (Care): Vitis vinifera or Common Grape Vine can be grown easily with least maintenance. Light: Full sun or light shade. Once established, the vine prefers soil on the dry side. It does not tolerate flooding and waterlogged conditions. Soil: Moist, light and well-drained soils. 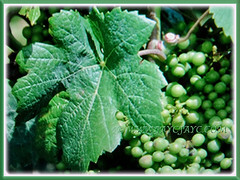 Do not grow in fertile soils as the vine will produce lots of lush foliage at the expense of fruit production. 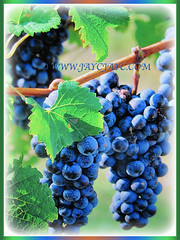 Others: Grape Vine has deep root system, so plant it in a large container or tub. Providing good air circulation is essential to reduce fungal diseases such as powdery mildew. Provide it a trellis to climb. To prevent legginess of the canes and increase longevity, the apical tips of the canes should be pinched off to force lateral shoots to grow, giving a bushier appearance. Once every two months, feed the vine with a fertiliser high in potassium to stimulate growth and fruit production. Generally free from serious pests and diseases. However, watch out for powdery mildew, phylloxera and honey fungus. For subtropical and temperate regions: Hardiness: USDA Zone 6-11. Vitis vinifera or Common Grape Vine is a deciduous climber that’s not tolerant of frost. The plant grows best when temperatures stay at or above 20-30°C from early spring through fall. When dormant, the plant can survive temperatures down to about -20°C, but young growth can be severely damaged at -3°C. It grows most satisfactorily when the winter is sufficiently cold to ensure a period of complete dormancy each year. Any pruning should be carried out when the plants are dormant otherwise they bleed profusely. A gardener in non-hardy regions is able to grow the Grape Vine indoors in a frost-free greenhouse or conservatory with sufficient light. Propagation: Easily propagated from seeds. Alternatively, it can be propagated from stem cuttings of mature wood or by layering. Usage: Vitis vinifera or Common Grape Vine produces grapes that can be eaten fresh as table grapes, processed to make wine and juice . 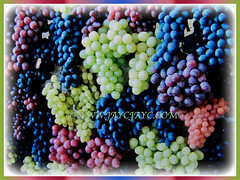 Also, it is dried to produce raisins that are popularly used in cakes, eaten as is or added to various dishes. Young leaves that are wrapped around other foods and then baked impart a pleasant flavour. 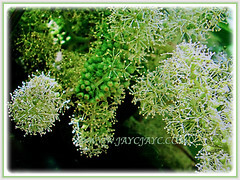 Its clusters of flowers are used as veggie. Young tendrils can be eaten raw or cooked. An edible oil that’s obtained from its seeds is suitable for mayonnaise and cooking, especially frying. The roasted seed is a coffee substitute. A yellow dye is obtained from the fresh or dried leaves. 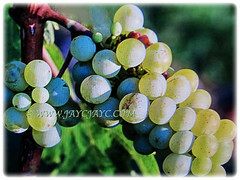 The whole fruit, skin, leaves and seed of the grape plant are used as medicine. 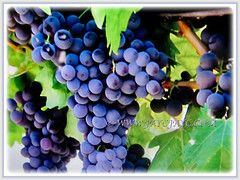 Grape is used for preventing diseases of the heart and blood vessels, varicose veins, haemorrhoids, hardening of the arteries, high blood pressure, swelling after injury or surgery, heart attack and stroke. Dried grapes, raisins or sultanas are used for cough, respiratory tract and catarrh, subacute cases of enlarged liver and spleen. 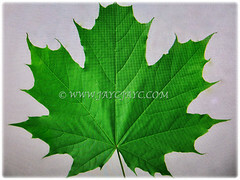 Grape leaf is used for attention deficit-hyperactivity disorder, chronic fatigue syndrome, diarrhoea, heavy menstrual bleeding, uterine bleeding and canker sores. Grape leaf might reduce inflammation and have astringent effects.